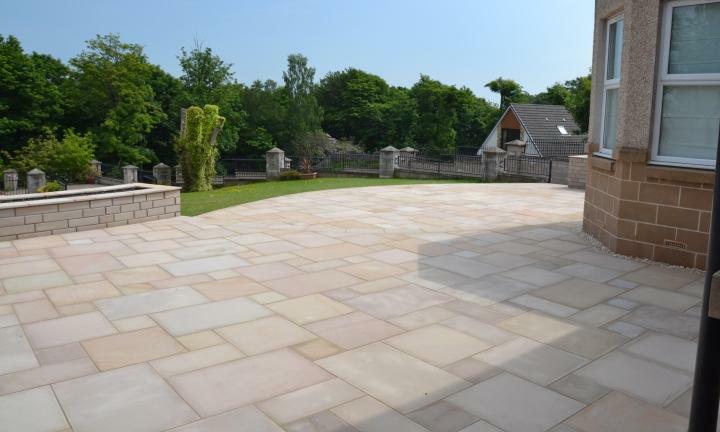 This stunning contemporary paving project took place in a large garden in Torwood. 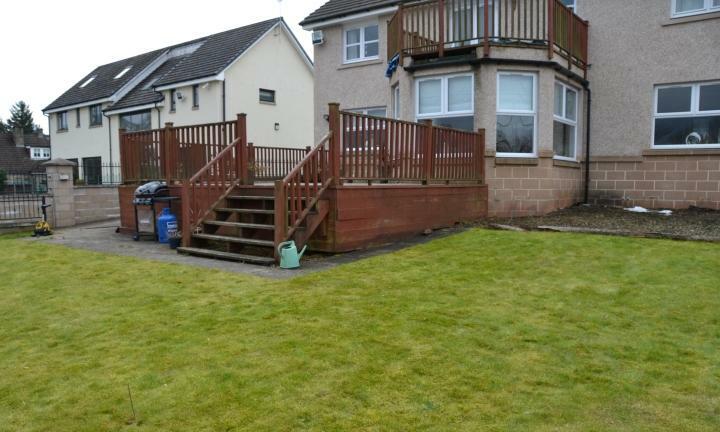 The existing garden was mainly laid to grass with a raised deck area outside the rear patio doors. Another decked area was situated further down the garden. 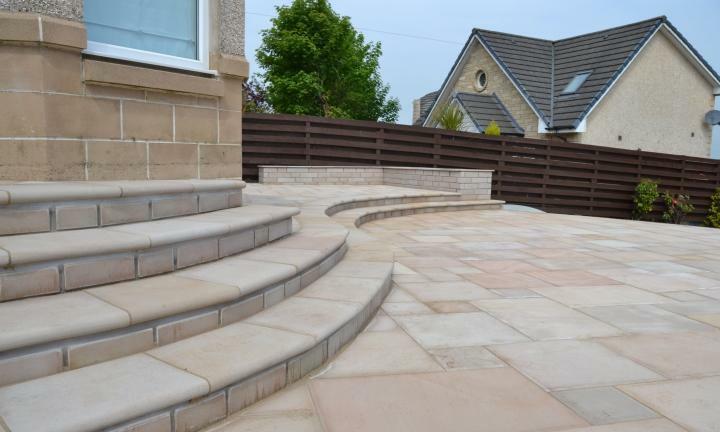 The clients wanted us to replace the tired decking with a contemporary new patio area with feature steps and walling. A large amount of usable space and soft lines were important to the clients. An initial design drawing was produced for consideration. The clients gave careful thought to choice of materials and how the space would work for them. Curved steps to gain access to the patio doors using matching bullnosed step treads. 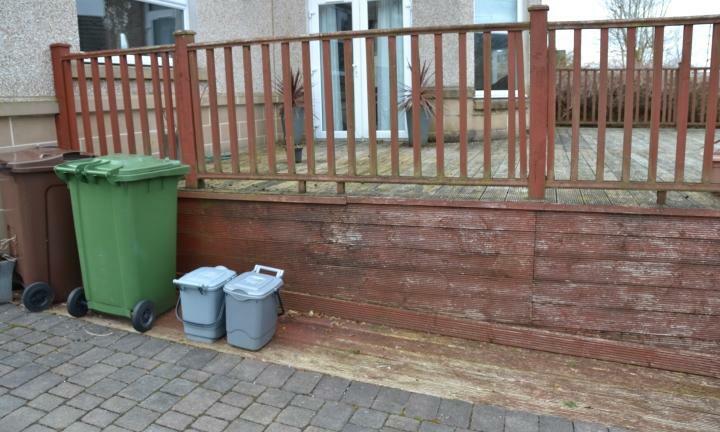 A further matching planter at the far side of the patio to disguise the bin area. 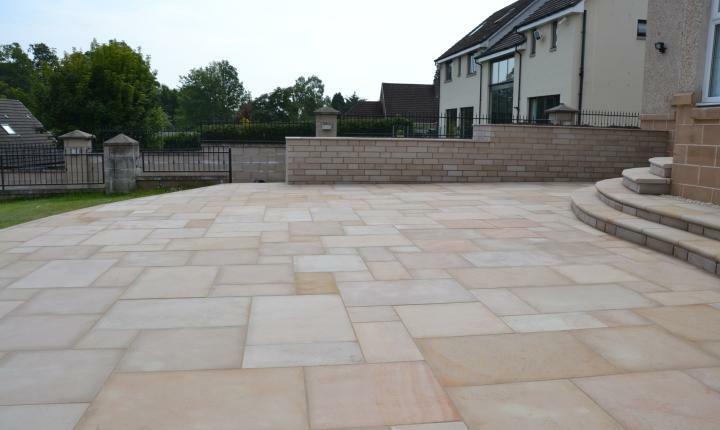 Sawn Versuro sandstone paving was chosen by the clients for the clean and visibly smooth surface which gave a stylish and elegant feel to the garden. The creamy colour of the golden sand paving and the curving lines added the softness that was also important to the clients. Careful thought was given to the positioning of the steps to provide a large amount of usable space. Practically positioned planters add height with plenty of space for adding bedding or other plants for year round colour and interest. 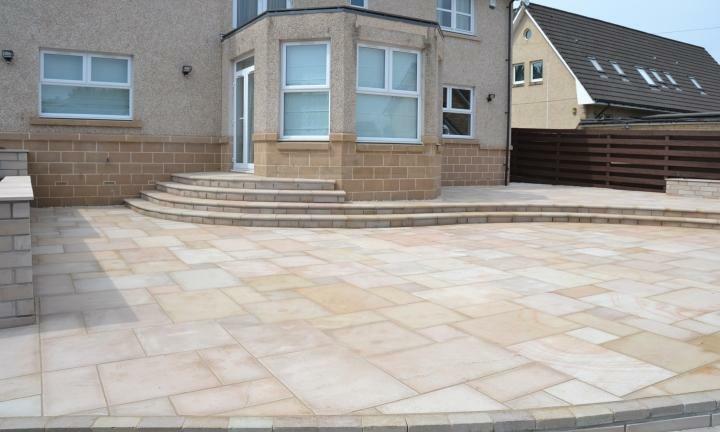 We were looking for a transformation of a big proportion of our back garden to provide a contemporary and usable patio area. From our initial consultation with Jamie, who provided a prompt design and estimate, to completion of the work, the customer service received was outstanding! The design matched our brief and the works were completed to the timescale given at the outset. Grant and Willy are a great team and work so well together. They were incredibly professional, prompt, very tidy, hard working and clearly take pride in their work. They were very flexible in response to modifications on site and provided suggestions in doing so. We are absolutely delighted with our new garden and cannot wait to use it over the years to come. In our experience, Gardens Galore pride themselves on both quality of output and customer engagement. We would not hesitate to recommend them; in fact, we already have!